To add image or video clips to your animatic, you must import image or video files into a video track. 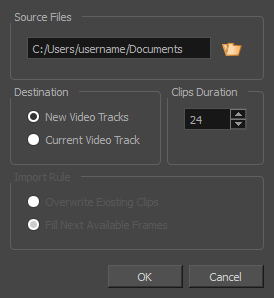 If you want to import clips into an existing video track, select the video track in which you want to import clips in the Timeline view. In the top menu, select File > Import > Videos/Images as Clips. Right-click on the video track in which you want to import clips, then select Import Videos/Images as Clips. 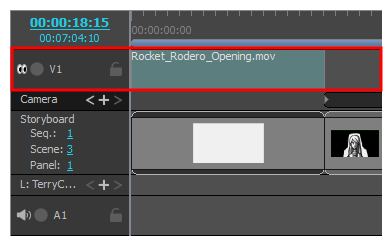 Right-click on the empty space below the tracks in the Timeline view, then select Import Videos/Images as Clips. The Import Video Clips dialog box opens. In the file browser, locate and select the image or video file that you want to add to your project, then click on Open. In the Destination panel, select New Video Track if your project does not have a video track or if you want to import the clip into a new video track, or Current Video Track if you want to import it into the currently selected video track. If you have selected an image, set the desired duration of the still image in the Clips Duration field. This determines the amount of frames the image clip will span over in the timeline. For example, if the frame rate of your project is 24 frames per second, and you want the image to span for 1 second, set the Clips Duration to 24. Overwrite Existing Clips: If there are existing video clips where the imported clips are supposed to be added, the existing clips will be overwritten. Fill Next Available Frames: If there are existing video clips where the new clips are supposed to be added, the clips will be trimmed just before the existing clips. The video clip is added to your project, in its target video track.